The Sport Bike does a sharp arc during drifts, as pictured. In my search for the best kart in Mario Kart 8 Deluxe, I paid almost no attention to the bikes. Neither did any of the build recommendation websites that I cited. That’s because a lot of the bikes in Mario Kart 8 didn’t used to be viable in competitive play. Turns out, I shouldn’t have been so quick to write them off. As of MK8 Deluxe, bikes—specifically, inside drifting bikes—have become contenders once more. 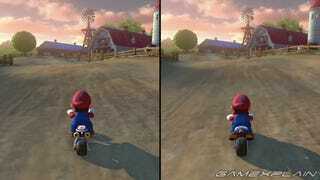 First, let’s talk about the differences between Mario Kart’s bikes. 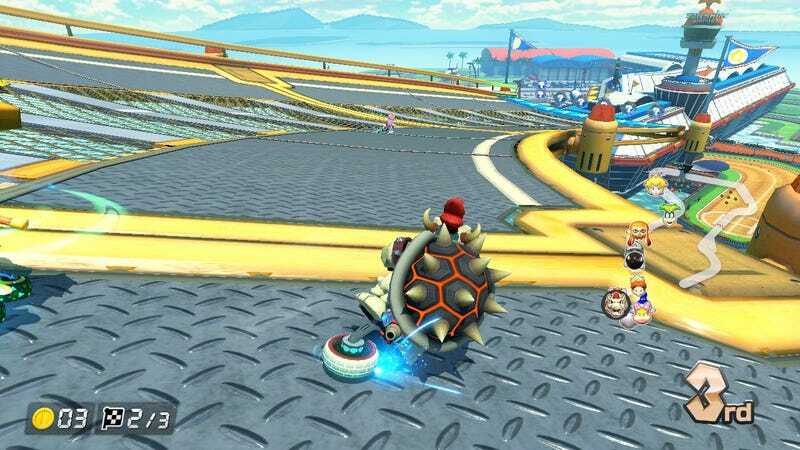 Mario Kart 8 Deluxe doesn’t include any new bikes that weren’t already in Mario Kart 8, and there are still two different kinds of bikes: those that use outside drifting, just like every four-wheeled kart, and those that use inside drifting. There are only five inside drifting vehicles, out of a total of 40 vehicle frames: the Comet, the Sport Bike, the Jet Bike, the Yoshi Bike, and the Zelda DLC pack’s Master Cycle. The debate about bikes versus four-wheeled karts has been going on for years. Back in Mario Kart Wii, bikes had some notable advantages. First of all, only bikes could perform wheelies, which provide a brief speed boost. Second of all, inside drifting bikes in particular had a leg up on other vehicles due to their ability to take sharper angled turns around corners. Inside drifters can shave off seconds on snakier stretches due to the tight angle of their drift. Outside drifting vehicles loop outward more, so they can’t zip through snaky sections as fast. Mario Kart 8 removed the manual wheelie option for bikes, and it also changed the drift arc of inside drifting bikes. Inside drifting bikes still slide differently from all the other vehicles in the game, but now the inward angle takes slightly longer to kick in. In other words, the differences between drifts wasn’t as stark as it had been in Mario Kart Wii. Inside drifting could still pose a potential advantage, but vehicle balance felt more fair as a result of that change in Mario Kart 8. Then, Mario Kart 8 players discovered fire hopping, and everything changed once again. After every successful drift, karts experience a brief surge of speed called a mini-turbo. To extend this boost as long as possible, players realized they could hop in the air to the left and right. This exploit ended up shaving milliseconds off of turn time. Every kart in Mario Kart 8 could fire hop… except for inside drifting bikes. As fire hopping rose in prominence among competitive Mario Kart players, inside drifting bikes got eclipsed by the reliance on fire hopping, with many players arguing that fire hopping was the only way to win races and ensure the best possible time trial scores. Meanwhile, since inside drifting bikes had already been nerfed, it came as no surprise that these vehicles ended up collecting dust on the MK8 competitive circuit. There are exceptions, of course. For example, Andre Segers of GameXPlain has competed with an inside drifting bike since the Mario Kart Wii days, and he placed first two times at Pax East 2016’s Mario Kart 8 tournament, in which he faced off against many fire-hopping opponents. Segers’ wins prove that it’s possible to win a Mario Kart 8 tournament without fire-hopping—but you may need upwards of a decade of Mario Kart practice to pull it off. My beginner inside drifting build: Dry Bowser, the Sport Bike, Retro Off-Road tires and the Plane Glider. As of Mario Kart 8 Deluxe, the game has changed once more. Fire hopping is gone. Technically, you can still do it, but it won’t speed you up anymore. This means the inside vs. outside drifting debate has returned. Players like Segers who have stuck by their inside drifting bikes since the good ol’ days of Mario Kart Wii can enjoy the resurgence of their favorite vehicle. Even though the inside drifting arc has still been nerfed to a more subtle state, these bikes continue to pose a potential advantage compared to other karts. However, many players aren’t used to practicing with these karts. Inside drifters take turns in a completely different way than any other vehicle in the game. If you’re a competitive Mario Kart player who didn’t bother to learn the muscle memory for an inside drift bike because you were too focused on finessing your fire hopping technique in MK8, you may as well stick with what you know. But if you’re an inside drifting fan who’s just been waiting for the fire hopping trend to die, now’s your chance… at least until some other game-breaking exploit maneuver gets discovered.